In the 1925 Scopes trial, the American Civil Liberties Union sued to allow the teaching of Darwin’s theory of evolution in public schools. Seventy-five years later, in Kitzmiller v. Dover, the ACLU sued to prevent the teaching of an alternative to Darwin’s theory known as "Intelligent Design"and won. Why did the ACLU turn from defending the free-speech rights of Darwinists to silencing their opponents? Jonathan Wells reveals that, for today’s Darwinists, there may be no other choice: unable to fend off growing challenges from scientists, or to compete with rival theories better adapted to the latest evidence, Darwinismlike Marxism and Freudianism before itis simply unfit to survive. Wells begins by explaining the basic tenets of Darwinism, and the evidence both for and against it. He reveals, for instance, that the fossil record, which according to Darwin should be teeming with "transitional" fossils showing the development of one species to the next, so far hasn’t produced a single incontestable example. On the other hand, certain well-documented aspects of the fossil recordsuch as the Cambrian explosion, in which innumerable new species suddenly appeared fully formeddirectly contradict Darwin’s theory. Wells also shows how most of the other "evidence" for evolution including textbook "icons" such as peppered moths, Darwin’s finches, Haeckel’s embryos, and the Tree of Lifehas been exaggerated, distorted . . . and even faked. Wells then turns to the theory of intelligent design (ID), the idea that some features of the natural world, such as the internal machinery of cells, are too "irreducibly complex" to have resulted from unguided natural processes alone. In clear-cut layman’s language, he reveals the growing evidence for ID coming out of scientific specialties from microbiology to astrophysics. As Wells explains, religion does play a role in the debate over Darwinthough not in the way evolutionists claim. Wells shows how Darwin reasoned that evolution is true because divine creation "must" be falsea theological assumption oddly out of place in a scientific debate. In other words, Darwinists’ materialistic, atheistic assumptions rule out any theories but their own, and account for their willingness to explain away the evidenceor lack of it. Darwin is an emperor who has no clothes but it takes a brave man to say so. Jonathan Wells, a microbiologist with two Ph.D.s (from Berkeley and Yale), is that brave man. Most textbooks on evolution are written by Darwinists with an ideological ax to grind. Brave dissidentsqualified scientistswho try to teach or write about intelligent design are silenced and sent to the academic gulag. But fear not: Jonathan Wells is a liberator. He unmasks the truth about Darwinism why it is wrong and what the real evidence is. 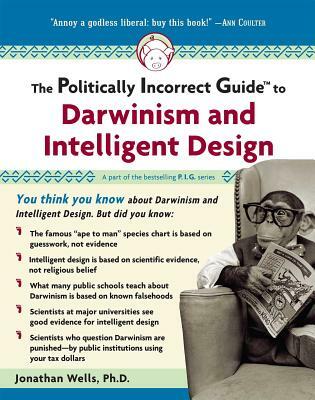 He also supplies a revealing list of "Books You’re Not Supposed to Read" (as far as the Darwinists are concerned) and puts at your fingertips all the evidence you need to challenge the most closed-minded Darwinist.